The next step in improving my homemade QRP multiband transceiver was to reconstruct the DDS VFO. This was not urgently neccessary but after some months of continously operating the rig I was not 100% satisfied with the spurious performance of the AD9850. 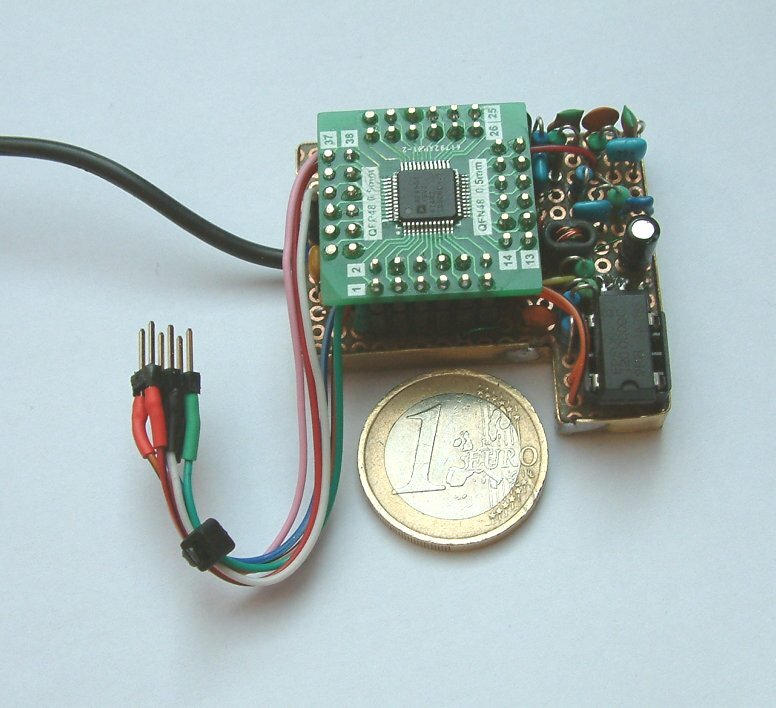 The AD9850 is a DDS device with only a 10-bit digital-analog-converter (DAC). These ones tend to put out still a quite high number of spurious emissions aka “birdies”.”Birdies” then are detected in the receiver causing unpleasant beep tones. Analog Devices (AD) also offers more professional DDS-chips with a better performing 14-bit DAC. The AD9951 is such a device. It is offered for about 25 USD by mouser.com and other vendors. It is also used in commercial ham band transceivers thus we can deduce that performance is improved compared to the cheaper DDS devices made by AD. The AD9951 needs multi supply voltages, i. e. 3.3V and 1.8V. Digital inputs are 5V-compatible if 3.3V as D_VDD_IO input voltage is applied. The device can be clocked up to 400Mhz. If you use a clock generator with lower frequency, an internal clock multiplier can be used. But this deteriorates phase noise to a certain degree. For my VFO which works in the range only from 13 to 20 MHz I use a simple standard 5V 120MHz clock generator and I do not use the internal clock multiplier. To make the clock oscillator’s output 1.8V compatible a simple voltage divider has been applied. As usual for me the DDS output consists of a balanced-to-unbalanced broadband transformer followed by an rf amplifier. For the latter one I use the MAV-11 broadband amplifier made by Minicurcuits. 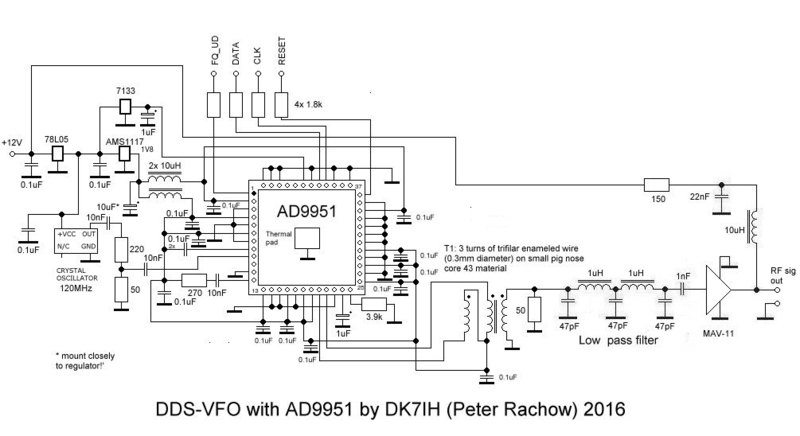 AD9951 based DDS VFO for QRP multiband transceiver (Peter Rachow, DK7IH, 2016) Click for FULL size image! The first impression when I connected the AD9951-DDS to my HP 8558B spectrum analyzer was that the signal looked different compared to a AD9850 generated signal. I’m very sorry, but so far I’ve got no photos but I’m planning an article that will deal with DDS comparisons which will have photos of the spectrographic analysis of the various signals. But it was visible on the first sight, that the signal looked much cleaner than a one produced by a DDS with 10-bit-DAC. OK, there were much lower sidetones to the main signal on the spectrum analyzer. Measurements are one side of the medal, but how would the DDS perform in the receiver? It approved to have improved when I installed the new DDS into the transceiver and listened to the bands. “Birdies” have vanished to nearly 100%, only some very weak spots are discernable. And the receiver noise also seems to have lowered by a certain degree. But I don’t have measured that so far. Measurements are still to be done. OK, let’s check it out the following days (20 meter is very quiet today!) and then I will be able to say if and how the 14-bit DAC. Stay away far from the Nyquist-Frequency of the chip! Basically this is one third (33%) of the clock rate. I recommend to lower this down to one fifth. So, if you use a clock rate of 100 MHz, don’t let the DDS produce more than 20 MHz! Don’t use the internal clock multiplier! Use a clock generator with the highest possible frequency! Use a clock generator that will put out 1.8 Volts pp! Keep ground leads on your pcb as wide and short as possible! Decouple AVDD, DVDD and DVDD_I/O effectively! Set DAC_RSET to a value that DAC current stays lower than 10mA. 3.9k is a recommended value. Flexible wiring is used to connect the board to the microcontroller. Shielded cable is mandatory for connecting the rf feed to tx and rx mixers. Underneath you’ll find some code snippets to set the frequency of the AD9951 device. The code has been copied 1 by 1 from my SSB transceiver’s software. Thus modification for your purposes might be neccessary. The floatingpoint constant 35.790… results from a division of 0xFFFFFFFF by f_clock which is given by the equation of the tuning word (see datasheet of AD9951). This could be converted to a bitshift operation too, if you use a programmable clock oscillator tuned to 134,217,727 Hz. Then the multiplication factor is 32 which can be easily achieved with another bitshift operation. _delay_ms(1); //Hold reset line hi for at least 20ns. Next ›DX with QRP – It really works! //convert result after rounding to next whole number to hex. // dds constant for 180mhz clock and a 32 bit accumulator. // of the result is shifted away. //performed a floating point multiply using integer math. K.K32 = Konst; //initialize Constant storage. Dear Peter, I have a problem in supplying crystal oscillators. If we use 30 Mhz instead of 120 Mhz, how do we make a change in the code? Problem: This won’t work for higher output frequencies because then you are very close to Nyquyst frequency. I recommend using a 75MHz oscillator minimum!